Mail4Rosey: My Name is Leona (children's book review). Disclosure: I received this book to help facilitate the review. All opinions stated are genuine and my own. Carol Gahara Harris is a Michigan native who has self-published a wonderful book that has earned the 2013 Gold rating from this year's Mom's Choice Awards. 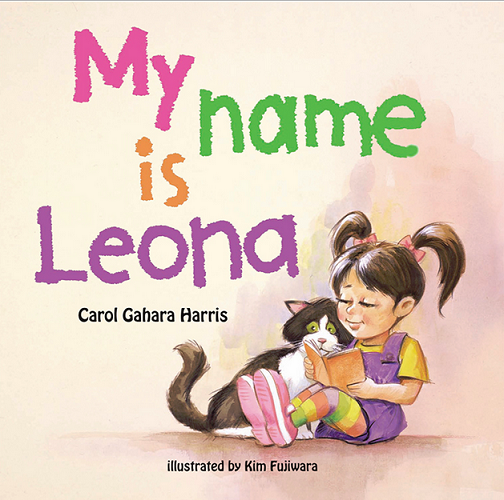 My Name is Leona tells the story of a little girl who doesn't like her given name. Working her way through a variety of other, 'more ordinary' names, Leona finally learns how her name came about and why it makes her special. She ends up liking her name, very much. Interestingly enough, Mr. Fuijwara, who has 30 years of relevant experience, is good friends with Harris' husband, having gotten to know him at the College for Creative Studies in Detroit. Also interesting (and awesome! ), the author tells that Leona was the name of her grandmother, and the alternate names her book character considers are all names of people within her family! This is a book that resonates well with most any adult, as most of us have gone through a period where we have thought about our name. It is also a great book for building self-esteem and helping children to see the importance of embracing their individuality. Keep your eyes and ears open for upcoming charity events linked to the book, and/or attended by the author. I recommend this book with five stars (the rating I just gave it on Amazon). You can purchase My Name is Leona at http://www.carolgaharaharris.com, in some stores in Michigan and Texas (see website for locations), and/or at Amazon. You can also follow My Name is Leona on Facebook. This definitely sounds like a book I'd like to read to my boys. Thanks for the heads up about this - I totally want to get it. My son liked it too. And we ended up having a conversation about his name! :) Thanks for reading, Robin. This looks like a cute book. I am going to recommend it to some of my friends with children who would enjoy it. A million thanks, Pam. This really is a great book! Congrats. to the author on her gold rating! It sounds like a wonderful children's book with a nice message. i've always been good with my name. My daughter has a unique name - I hope she never hates it. 3 of our 4 kids have really unique names. I hope they never hate them either. :) Thanks for stopping by! This books sounds really very good Rosey! The message is so important. It does have positive messages all the way through, in the illustrations (everyone's drawn happy/content) and the writing. We really enjoyed this book. Thanks for reading, Judy! I like this book, so many kids have distinct feelings about their names! I never hears of this book. My kids are grown up now. I have two who are grown. Goes by fast. I'm glad I have two in the house still. :) Thanks for visiting. Bobbi, I laughed!! Out loud. That's NOT at all in line with the book's them, lol! It is just wonderful. I love ours, I'm thinking of giving a copy to my son's Kindergarten teacher to read to her class. :) Thank you for reading the review! I happened to like my own name, but I know many other people that go by their middle name. I know someone who uses her middle name in place of her last one. Alissa is a pretty name. I never like my name. My dad wanted a boy and so, I got the name Terry. When people see my name on paper, they think I am a boy. It's def. a cute book (msg. and pictures!). Thanks for visiting! that's kind of funny. our little friend leo, aged 2, has a friend at daycare named leona, age 4, and she HATES her name!! Oh my goodness, how I hated my name! My parents were immigrants and named me after a 1950's German bombshell actress that nobody ever heard of. Not many Anita's around! I like Anita. I had a friend with that name years ago. I haven't thought of her in years, we simply moved into different states from one another & lost contact. Very cute book. I will have to look for this for our collection! This sounds like a really good book for kids. Who hasn't disliked their name at one point or another? Core-in? I think it's pretty. 3 out of 4 of my kids have unique names. What an adorable cover. Really cute. Sounds like this is a good book for any child whether they like their name or not. It would help them to be more sensitive to others that maybe don't have a name that is popular or is different. Agreed on all accounts, Pam. This is def. a two-thumbs up book. Sounds like a rather interesting book. Just like Leona I didn't like my name either and wanted it changed. Will have to check it out. It really does resonate w/so many of us!! Interesting story, similar to mine, I did not like my name too, until I learned that it had a special meaning. I think this book is great for any kid to read. Def. Than you for the kind post! You HAD to have loved Noelle. I love the name Noelle!! This is a really good book. I love that this book helps to build self-esteem and pride in one's identity. These tools are crucial for kids to have, especially when they become adolescents. Agreed, and it does it through the message, not just telling them outright, so it's subtle, but spot-on. Thank you for your visit! It's such a common theme! The author was really on to something with this one! :) Thank you for your visit! I like this. I know the kids would too. I love the drawings in this one too! Just an all around cute book!